The quarterfinals kicked off today on the Gold Coast with ROXY team rider ‘s Stephanie Gilmore, Bianca Buitendag and Sally Fitzgibbons all in the mix! The call was made bright and early for the #ROXYpro and after a day like yesterday you could feel the excitement in the air. Local favorite, Stephanie Gilmore, shined today against yesterday’s standout, Courtney Conlogue, in the first of 4 heats run today at the ROXY Pro Gold Coast. The biggest upset was in the 3rd quarter final heat when ASP Rookie Bianca Buitendag took to the water and dominated against number 2 in the world, Tyler Wright. 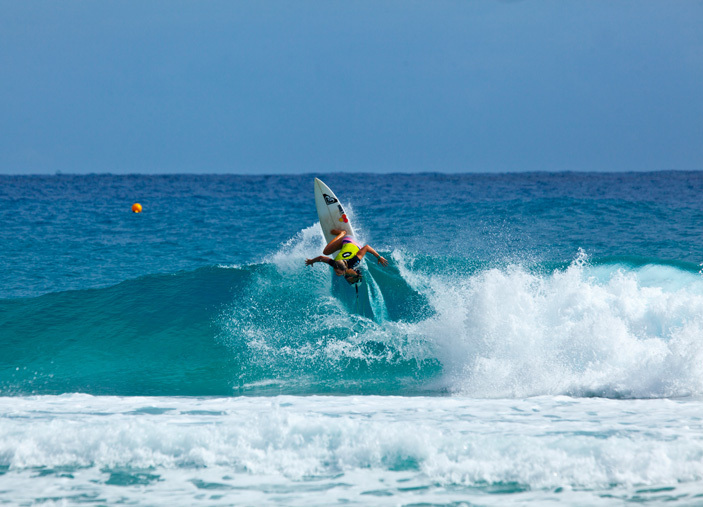 A beautiful display of back-hand surfing saw a shock elimination of last 2013 ROXY Pro Champion. The next call will be made by the ASP at 6:30 AM (local time) tomorrow, so stay tuned…we could be crowning the 2014 ROXY Pro Champ! In the meantime, check out what else we’ve been up to on the Goldy!